This article describes the Halo 2 version of the plasma cannon. For the version from later games, see Type-52 plasma cannon. 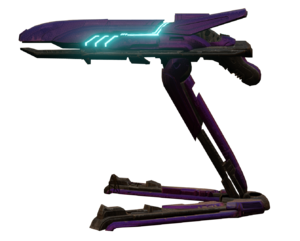 The Type-42 Directed Energy Support Weapon (T-42 DESW) otherwise known as the Plasma Cannon, is a manned automatic Class-1 plasma turret in use by the Covenant. Though frequently observed earlier in the Human-Covenant War, the T-42 was later phased out of widespread use in favor of its newer manifestation, the Type-52 DESW, due to the latter's better overall performance. Used as a heavy support weapon in ground based combat, it provides a rapid stream of powerful plasma rounds, to suppress enemy movements and offensive actions. The cannon is basically a mobile support weapon and as such offers no protection for the operator which is usually an Unggoy Heavy, although it can occasionally be used by a Sangheili Major or a Sangheili Ranger. The gunner is completely exposed to enemy fire, so a well covered emplacement position would be desired for prolonged use, especially if under fire. This separates it from the Shade turrets, as Shades offer some measure of protection for their operator but are, however, not man-portable. Unlike the similar Type-52 plasma cannon, the Type-42 does not include the shield-like protrusions on the crest of the barrel and appears very much like an elongated Type-25 plasma rifle. The T-42 DESW is carried and operated in a similar fashion to the UNSC's M247 GPMG. In the portable form, it includes a two-part foldable mount that contacts the ground in the shape of a "V". It has an approximate 65 degree turn radius and 50 degree pitch. It fires plasma bolts similar to those of the Covenant Plasma Rifle, but at a much higher rate. A plasma generator, developed by the San'Shyuum, is built into the tripod which allows the gun to fire indefinitely. These generators were considered so efficient they were deemed borderline heretical centuries before the Covenant War, as they encroached too closely on the "divine perfection" of Forerunner technology. In the post-Covenant War era, the Office of Naval Intelligence determined that the Type-42 plasma cannon is far more advanced than they initially assumed. Since the operator is completely exposed, it is logical to kill the gunner, and not attempt to destroy the gun itself. The gunners are usually positioned low to the ground and as such can be difficult targets to hit. It's advised to attempt this from cover, since the sheer volume of fire the cannon can lay down is not to be underestimated. Once the operator is down, a well placed grenade or some other explosive should be used to put the cannon out of action temporarily (although fairly rare, another Grunt will operate the turret if the original gunner is killed). The Halo 2-era Plasma Turret can't be detached but can be meleed or shot off using UNSC or Covenant firearms. Also, the turret can be manned after it has been mounted by an Unggoy Heavy. On several missions, Gunner Grunts can sometimes be seen carrying a plasma turret over their shoulders as Marines do with the cut-down version of the M247 GPMG. The first time this is seen is on the mission Cairo Station when you get to Hangar A-02. This behavior can also be witnessed in Commons B-01, and again by a Sangheili Ranger outside the station. On Outskirts and Metropolis, Heavy Grunts are found manning plasma cannons in and around the tunnel, and on Gravemind, two Gunners are deployed near the start of the level to take out the Master Chief. While on The Arbiter, a Special Operations Unggoy is seen carrying a plasma turret over his shoulder, then deploying it and firing on the Heretics. This behavior is also mentioned in Halo: Ghosts of Onyx, at the beginning of the battle of the Core Room. In early builds of Halo 3, the Halo 2-era Plasma Turret was used as a placeholder before the Halo 3-era Plasma Turret was finalized into the game. During the Halo: Reach Multiplayer Beta, the T52 DESW featured in the game was erroneously labeled as "Type-42 Directed Energy Support Weapon" in Bungie.net game stats reports. This was not fixed for the final game. Forward view of the Type-42 Directed Energy Support Weapon. Rear view of the T-42 DESW. Another profile view of the Type-42 DESW. An Unggoy Heavy carrying a Type-42 DESW Plasma Cannon in Halo 2. A model of the T-42 for Halo 2: Anniversary. A T-42 during the Battle of Earth. HUD of the T-42 in Halo 2: Anniversary campaign. HUD of the T-42 in Halo 2: Anniversary multiplayer. A Sangheili using a T-42 on Skyward. The T-42 DESW alongside other weapons in the Joyride Studios Halo 2 Heavy Weapons Pack. Enhanced profile view of an action figure depiction of the T-42 DESW. Concept art of the T-42 in Halo 2: Anniversary. ↑ Halo 3 ViDoc: Et Tu, Brute?